No sooner has 2011 turned its new leaf than the Parkwood Park Committee has turned theirs. This past Saturday, January 8, Sheri and Jim Kennedy and Steve Elmore spent over 5 hours in Parkwood Park preparing for the next Clean-up Day, very tentatively set for January 22, 2011. Jim and Steve chainsawed privet, cherry laurel, and other invasives while Sheri treated stumps and worked on lopping the smaller plants. 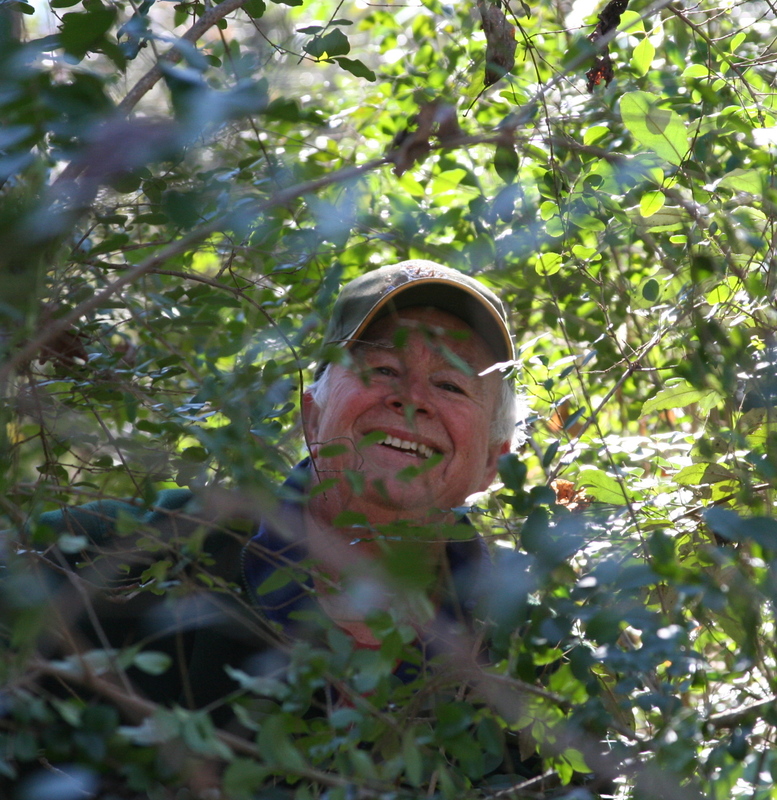 Neighbor Bob Stewart lent a hand with cutting and spraying invasives for a few hours, too, and the crew focused mainly on the edges of the Park near W Ponce de Leon Ave moving down E and W Parkwood Roads, felling invasive saplings for pickup and chipping later on. Erin Elmore stopped by to take these photos of the team hard at work. Thanks to all these neighbors for working Saturday! Similar preparation was made with chainsaws for the Park’s 2nd official Clean-up Day back on November 13, 2010. The Park’s first-ever Clean-up of 2010 was October 16. These efforts were productive, with much of the W Parkwood Rd perimeter cleared enough to see the beautiful native hardwoods’ fall colors back in October and November. A chipper on Nov. 13 hauled off two whole truckloads of mulch made from all the chainsawing and lopping. 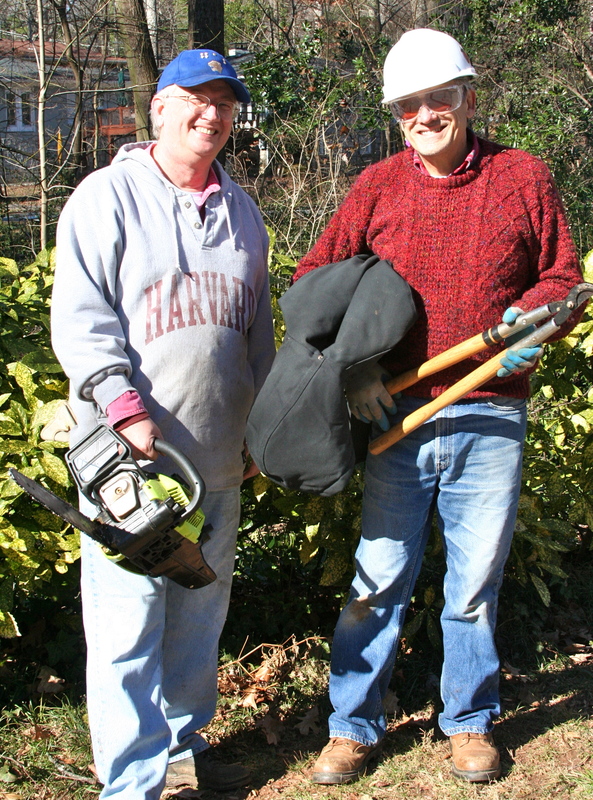 Between 20-25 neighbors volunteered on each of the 2010 Clean-up Days, and the Park Committee welcomes all who wish to join in during January or February, as the weather permits of course! Stay tuned for more info from the Park Committee as to dates and times of upcoming Clean-ups. To see BEFORE and AFTER photos of Parkwood Park surrounding the October and November Clean-ups, click here. Also click here to see some historical BEFORE photos of the Park with current AFTER shots. For photos of the October 16, 2010 Clean-Up Day activities, click here. For photos of the November 13, 2010 Clean-Up Day activities, click here. To see photos of some native and invasive plants in Parkwood Park, click here.